This quiche has your breakfast favourites in one delicious oven-baked dish. 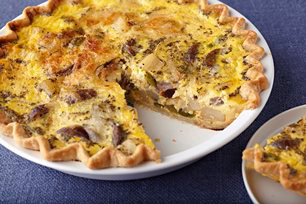 Made with hash browns, sausage and eggs, this quiche recipe is a keeper! Line 9-inch pie plate with crust; flute edge. Pierce crust with fork. Bake 5 min. Remove from oven. Reduce oven temperature to 375°F. Melt margarine in large skillet on medium heat. Add sausage, hash browns, peppers and onions; cook and stir 3 min. or until onions are softened. Spoon into crust. Whisk eggs, milk and thyme in medium bowl until blended; stir in cheese. Pour over ingredients in crust. Bake 40 to 50 min. or until knife inserted in centre comes out clean. Assemble and bake quiche as directed; cool completely. Refrigerate up to 24 hours. To reheat before serving, bake in 350°F oven 20 min. or until heated through.